- Cleansing. After the initial dry skin analysis, a facial begins with a cleansing to remove impurities and makeup in preparation for skin analysis. - Skin Analysis. The esthetician covers your eyes and looks at your skin through a brightly lit magnifying lamp that reveals various skin conditions. The analysis and consultation determine the product and procedures to be used and home-care needs. - Exfoliation using a mechanical or chemical exfoliant. Mechanical exfoliation has a gritty texture and usually happens while a steam vapor is directed at your face. A chemical peel can be a stand-alone treatment or part of the facial. It is generally an "upgrade" and done in a series. - Extraction of blackheads or whiteheads if you want it and need it. (It can cause broken capillaries and discoloration if done on sensitive skin, or done improperly.) People have different pain tolerance for extractions. They can be uncomfortable, especially on thin or ruddy skin. - Facial massage to both relax you and stimulate your skin and facial muscles. - A facial mask targeted to your skin type (dry, oily, combination, sensitive, mature) and condition. 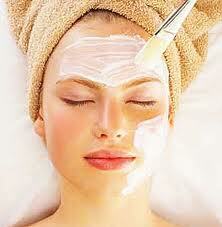 During the facial, the esthetician should stay in the room and give you a scalp massage or some other service. If they leave the room to let you "relax," don't go back.